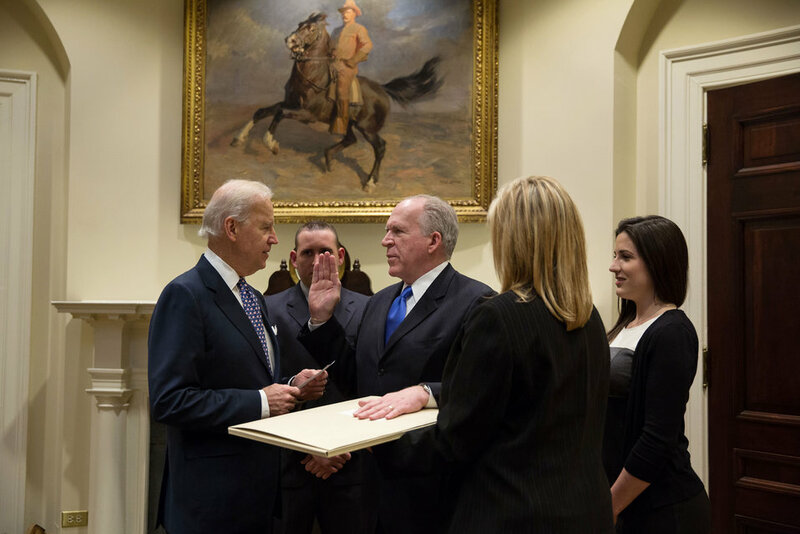 Vice President Joe Biden swears in CIA Director John Brennan in the Roosevelt Room of the White House, March 8, 2013. Members of Brennan's family stand with him. Brennan was sworn in with his hand on an original draft of the Constitution, dating from 1787, which has George Washington's personal handwriting and annotations on it. (Official White House Photo by David Lienemann) This official White House photograph is being made available only for publication by news organizations and/or for personal use printing by the subject(s) of the photograph. The photograph may not be manipulated in any way and may not be used in commercial or political materials, advertisements, emails, products, promotions that in any way suggests approval or endorsement of the President, the First Family, or the White House.